Lama Zopa Rinpoche and Osel after Osel’s talk to Kopan, July 2011. Buddha House Celebrates Its 30th Anniversary! Lama Zopa Rinpoche is continuing with essential physiotherapy while based in Kopan Monastery, Nepal. Go to Rinpoche’s Health – Updates and Practices for more information and to subscribe to our RSS feed for updates. “Osel is on the floor, flat on his back beside my desk, thinking about Rinpoche’s request to give a talk to all the Kopan monks and wearing a chuba (Rinpoche had one made for him). He says he doesn’t like to be pushed or pressured into doing things but it seems he is in the process of coming to terms with Rinpoche’s request although it appears hard. In the end he does give the talk. All the monks are present as well as Lama Lhundrup (a huge effort to come to this, his cancer is quite advanced) and Rinpoche. Rinpoche gave a short talk first, and then asked Osel to speak. Osel gave the talk in Tibetan (very good Tibetan). He gave ‘modern’ advice and the monks gave a very warm response. They seem to want more! Osel said he was more than happy with his visit to Kopan. It was ‘more than perfect,’ he said! Earlier this year when Rinpoche flew from Singapore to the United States, a very devoted air stewardess sat on the floor in the aisle asking Rinpoche many questions about his prayer wheel (Rinpoche always travels with and turns a prayer wheel while on a plane.) Rinpoche arranged for her to receive a prayer wheel and sent her a letter, which is excerpted below. 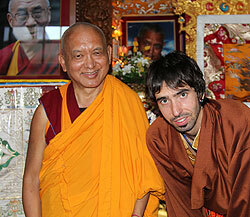 Please go to Rinpoche’s Advice page to read the full advice. “Regarding the prayer wheel, I wanted to explain how you can use it. Before using the prayer wheel and reciting the Chenrezig mantra, please generate bodhichitta motivation. The purpose of my life is to benefit all sentient beings from whom I have received all my past happiness from beginningless rebirths. It is due to the kindness of numberless sentient beings (as there are numberless universes – scientifically and also it is mentioned by Buddha) so they are most unbelievably kind, they are the most precious ones. All my present happiness has been received due to their kindness. So they are the most kind, most dear ones. All my future lives happiness is received from numberless sentient beings, who are the most kind, most precious, most dear ones. Then even my ultimate happiness, liberation from the oceans of samsaric suffering and its causes, I received from numberless sentient beings, so they are the most precious, most dear ones. Then full enlightenment, the peerless happiness, the completed qualities and cessation of not only the gross obscurations but the cessation of the subtle obscurations – this is received from numberless sentient beings who are the most kind dearest ones in my life. So keep your mind in that thought. Recognize and feel how precious they are. Think: This one time I have received this perfect human rebirth. I have the opportunity to develop my mind on the path to enlightenment; I have the opportunity to help others. Just this time I have the opportunity to liberate every single sentient being from each realm from the oceans of samsaric suffering and bring them to full enlightenment. Therefore, I must achieve full enlightenment. Therefore, I am going to do the practice of turning the prayer wheel and chanting the mantra in order to achieve enlightenment quickly for all beings. In order to benefit all beings quickly, I need to achieve full enlightenment quickly. For that I need to actualize the path to enlightenment. Therefore, I need to purify my defilements and obstacles and to collect extensive merit. Therefore, I must generate great compassion for each and every sentient being. Therefore, I am going to do the recitation of mantra and the meditation of turning the prayer wheel. This motivation is the best motivation, the best Dharma, because you generate the mind of bodhichitta and from that you collect limitless skies of merit, skies of good luck and virtue. With this motivation, then whatever you do – such as reciting OM MANI PADME HUM – is for all sentient beings, for their happiness. With each recitation of the mantra you collect limitless skies of merit, good karma, virtue and good luck. Each mantra becomes the cause of enlightenment, and by the way, becomes the cause to be free from the oceans of samsaric suffering, and by the way, you receive happiness in future lives. You also receive success in this life – no question. This happens without even thinking, it just happens by the way. The benefits of reciting Chenrezig’s mantra are inconceivable. If you recite the long mantra 7 times it purifies 100 lifetimes of negative karma. If you recite the long mantra 21 times it purifies 1,000 eons of negative karma. If you recite the long mantra 108 times (one mala) it purifies 40,000 eons of negative karma. This is just to give you a very rough idea of the benefits and the power of this mantra. Not only does it purify all this negative karma, but also it fulfills all your wishes for happiness, to achieve enlightenment, to be able to liberate numberless sentient beings from the oceans of samsaric suffering and its causes, karma and delusion, and to bring each and every sentient being to the peerless happiness – full enlightenment. There is no greater success than this in your life. By the way, you achieve liberation from the oceans of samsaric suffering; by the way, you achieve all the happiness of future lives, and by the way, you achieve all the happiness of this life, as well as all your needs. One thing to mention: Without creating the karma you cannot find success. Whether it’s to find a job, maybe it is unbelievably difficult, even if one makes unbelievable effort, sometimes one is unable to find success. It is by practicing Dharma that one is able to purify negative karma and to collect extensive merits. By reciting OM MANI PADME HUM and other methods, it becomes so unbelievably easy to have success and to have all happiness. By realizing this – you the one person – just by generating compassion, are able to liberate numberless sentient beings from each realm, from the oceans of samsaric suffering and bring them to full enlightenment. This is most amazing! These are the benefits that you get by reciting this mantra even just one time. Then the particular benefit of this mantra is that you generate great compassion for all sentient beings. Therefore this is the best thing that you can do for world peace; reciting these mantras is unbelievably important. It makes one’s mind more peaceful, more calm, more compassionate to others even if one doesn’t know Buddhist philosophy, the hundreds of volumes of Buddha’s teachings and the two hundred volumes of the commentaries of the great highly attained holy beings, the great Indian pandits, as well as the many teachings written by the enlightened Tibetan lamas. Without even learning all of this, just chanting these mantras makes your life so peaceful and you can benefit others so much. Even if one has no intelligence or no understanding of Dharma, you get unbelievable benefits by reciting these mantras: you purify past negative karma and collect extensive merits, your mind becomes more compassionate to others. In this way so many sentient beings don’t receive harm from you, and receive peace and happiness from you. You go towards enlightenment day by day. Please read the book Teachings from the Mani Retreat [published by Lama Yeshe Wisdom Archive] – this has a much better explanation. It is very, very important to discover this. I am sure you have a good heart, so therefore you can help so many people by reciting OM MANI PADME HUM. You will inspire other people, so many people will be inspired by your good heart, your good example. This is how you can bring world peace and happiness from life to life to all sentient beings. Due to all the three time merit collected by myself, numberless sentient beings, buddhas and bodhisattvas, by having generated bodhichitta in my heart every day, may everyone in the world live their life only to benefit others, may no one harm another and whatever they do with their body, speech and mind, may it only cause enlightenment and happiness to all sentient beings. May no one experience war, famine, disease, torture, sickness, dangers of earth, water, tsunami, wind, as well as may no one experience dangers when traveling. May they always be safe when traveling, including in the airplane. Thank you very much. I don’t need any present. You mentioned that you wanted to give me something, but if you could do this practice, it would be the most unbelievable present to me. Maybe in the airplane you may not be able to carry the prayer wheel (not sure) but you can carry the mala and chant the mantra and do the same meditation. In the future it would be so great if they could produce airplanes that have a prayer wheel inside or on the roof. There could be a compartment that has a large prayer wheel inside and those people who want to practice or turn the prayer wheel can come into the compartment and turn it (this is just to make you laugh). Thank you very much. If you are able to practice like this, it is the best present, better than offering a billion, zillion dollars. Thank you very much. Excerpted from a longer letter, the first part of which – The Incredible Benefit Offered by FPMT Centers, Projects and Services – was featured in the March edition of the FPMT International Office News and is available freely on Rinpoche’s Advice page. NEW! TENETS: The four main schools of Buddhist tenets represent the differing levels of interpretation of the sutras delivered by the Buddha. Kurukulla Center’s Geshe Tsulga gives a clear and practical commentary on Jetsün Chökyi Gyaltsen’s Presentation of Tenets, showing how the Madhyamaka teachings on profound emptiness and buddhahood evolve from and complement the more elementary teachings of the Vaibhasika, Sautrantika and Cittamatrin schools. NEW! Shiné Retreat: Choden Rinpoche and Ven. René Feusi offer five teaching sessions and five meditation sessions from the shiné retreat held at Vajrapani Institute, June 2011. These teachings are available in streaming video and MP3 audio format. Basic Program: The third BP Online subject, “Tenets,” became available on the Online Learning Center at the end of July. In early August, Chenrezig Institute’s interpreter plus one other student took and passed the final exam. Masters Program: The long awaited MP Guidelines for Implementation were finalized in July, a major achievement that has taken many years to accomplish. It is available from Education Services for centers preparing to offer the Masters Program. White Dzambhala Torma Offering is now available in booklet and e-book formats. This practice requires empowerment. Heart Advice for Retreat has been revised and is now available in e-book format for download. It includes an additional powerful teaching from Rinpoche on “The Happiness of Dharma” extracted from the 2010 Light of the Path retreat teachings. This is a must-have for all practitioners, especially those engaging in longer retreats. The FPMT Puja Funds helps to sponsor the saffron water that is offered to adorn and honor the Bouddhanath Stupa in Nepal. The FPMT Puja Fund exists to provide sponsorship for continuous practices dedicated to the long life of His Holiness the Dalai Lama as well as for the success of all FPMT’s students, benefactors and Dharma activities. Offerings to all the monks of Kopan Monastery and nuns of Khachoe Ghakyil Nunnery in Nepal. Recitation of the entire Kangyur – the translated words of Buddha Shakyamuni in 108 volumes, including the entire Prajñaparamita – by more than 6,000 monks of Sera Lachi Monastery (Sera Je and Sera Me) in India. Offerings were made to all the Sangha. 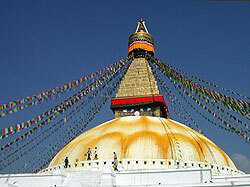 White wash and four giant saffron painted flower petals offered to Bouddhanath and Swayambunath Stupas in Nepal, as well as offering new umbrellas to the stupas’ pinnacles. A new set of robes of the most precious material was offered to the Buddha inside the Bodhgaya Mahabodhi temple as well as the Jowo Buddha in Lhasa’s Jokang. Gold was also offered to the holy face of the Jowo Buddha. Offerings to all of Lama Zopa Rinpoche’s gurus and to IMI Sangha within FPMT’s different Sangha communities around the world. This was the third year that Lama Zopa Rinpoche arranged sponsorship of two different 100 million mani retreats by the Tashi Chime Gatsal Nuns who are from a very remote and poor nunnery near the holy mountain of Lapchi, Nepal. Each of the 100 million mani retreats are done over three months. Rinpoche also arranged for a lama to give lam-rim teachings at the same time so that the retreat would be more integrated. FPMT wishes to express deep gratitude to Catherine Lau for her kind support in helping this project. All of the pujas and practices were done with strong dedications for all the FPMT centers, projects, students and benefactors. With heartfelt thanks to all the kind benefactors of the FPMT Puja Fund who make these incredible offerings possible, please rejoice! Please enjoy the latest Mandala eZine, the quarterly online publication of Mandala. 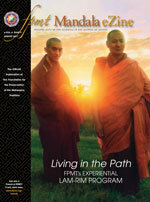 This issue’s cover story, Living in the Path: FPMT’s Experiential Lam-rim Program, takes a look at the first FPMT education program specifically designed to preserve the teaching and practice lineage of Lama Thubten Yeshe, the founder of FPMT, and Lama Zopa Rinpoche, FPMT’s Spiritual Director. The eZine is a multi-media experience, featuring video and audio clips of new and archive teachings in addition to original written articles and historic photos. You may have noticed a new name on the Mandala masthead. This summer, Laura Miller has taken over as managing editor, after working for five months as an editor. Laura is finishing an MFA in creative nonfiction at Portland State University and has also studied at Maitripa College in Portland, Oregon, USA. Carina Rumrill, who held the managing editor position for more than three years, will continue to work for Mandala in a part-time capacity, allowing her to spend time with her new baby. Michael Jolliffe, who received his MA in Advanced Buddhist Studies from Maitripa College in 2009, continues in his role as assistant editor at Mandala. The most current International Office staff listing is always available online. August 3, 2011 was FPMT’s Ninth International Sangha Day. We hope your celebrations went well (or will go well if you are waiting for a more suitable time for your center). Please send Claire any stories about what you did, what went well … thank you. 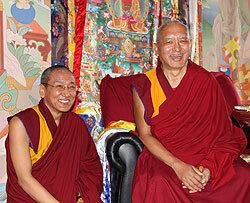 Lama Zopa Rinpoche with Khenrinpoche Geshe Chonyi after his enthronement, August 2011. Khenrinpoche Geshe Chonyi’s appointment as abbot of Kopan Monastery, Nepal, has been officially confirmed by the Private Office of His Holiness the Dalai Lama. We Welcome Two New FPMT Study Groups! These new groups mean that there are now 161 FPMT centers, projects, services and study groups in 41 countries! Lama Zopa Rinpoche holds up his handwritten message for Buddha House, July 2011. “Event coordinator Kerry Headley purchased a superb cake with our logo/name on it. People were delighted that Rinpoche had insisted that it be the most delicious cake we could buy – and it was. Osel with the managing nuns of Khachoe Ghakyil Nunnery, Nepal, August 2011. Sponsor pujas and you can help the Tara Pure Land Nunnery and Educational Centre, a branch of Khachoe Ghakyil Ling Nunnery, in Sarnath, India while helping yourself. Tara Temple was created there to provide a place for the full time practice of Tara and features statues of the 21 Taras. Fifteen nuns live there and recite the Praises to the 21 Taras twenty-four hours a day. Additionally, every morning, the Four Mandala Offering to Cittamani Tara and the White Tara puja are performed. You can participate in the daily Tara praises by sponsoring recitation for one year. You can also request White Tara pujas to remove obstacles to your long and healthy life. Your personal dedication will be read every day during the pujas. You can sponsor your puja on Kopan Monastery’s convenient website by choosing the option “pujas performed at the Tara Temple.” You can also send your special request to Tara Temple directly by contacting the manager, Ven. Thupten Dekyi. Tse Chen Ling, USA is looking for a spiritual program coordinator; Mahamudra Centre, New Zealand and Centre Kalachakra, France need vegetarian cooks; FPMT Mongolia is looking for a director for its Lamp of the Path NGO; and Jamyang Buddhist Centre, UK is looking for an administration officer.